The City of Edmonton is developing a concept plan for 170 Street from Yellowhead Trail to Anthony Henday Drive. 170 Street in the study area is a major arterial road serving a growing industrial area in northwest Edmonton and is a 24-hour truck route from Yellowhead Trail to 137 Avenue. The route serves the adjacent industrial and business communities and is an important commuter corridor, connecting Edmonton with St. Albert. The plan identifies long-term improvements to 170 Street to accommodate traffic growth, address multi-modal transportation needs, and manage access ways for existing and future industrial development. The project is separated into two phases. Phase 1 is to upgrade the route from the existing undivided 4-lane rural to a divided 4-lane urban roadway and Phase 2 includes a 170 Street / CN Rail grade separation concept plan. Concept plan preparation for Phase 2 of the project will occur separately at a later stage. 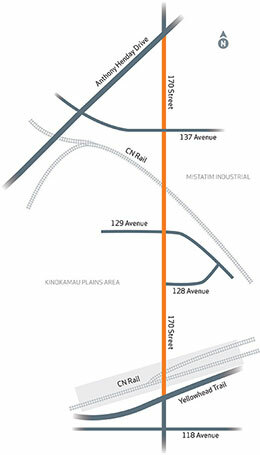 The 170 Street planning study is in the concept stage of the project lifecycle. The planning study was initiated in summer 2014 and completed by end of the year. Public feedback has helped city planners to understand the current and future transportation needs of this corridor. There is no funding allocated to this project and therefore no timeline for construction.